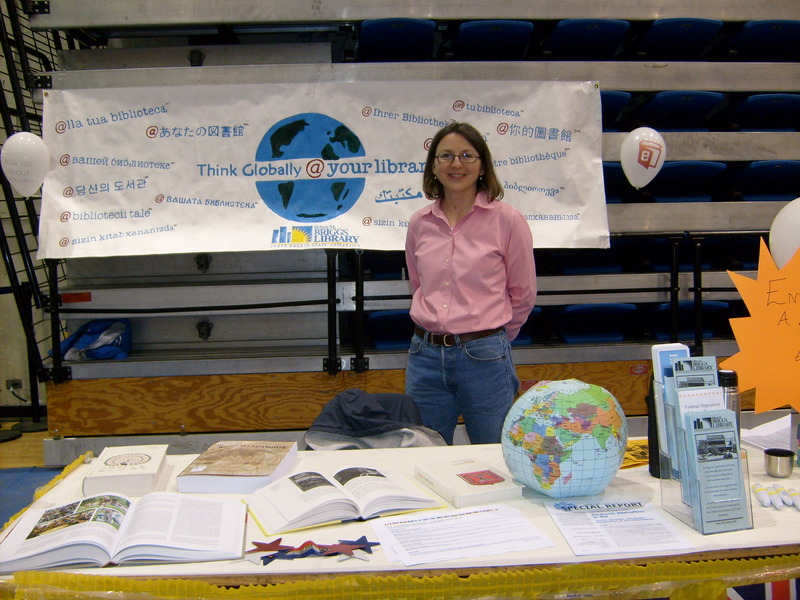 Briggs Library staff members will be hosting a booth at SDSU’s 29th Annual Festival of Cultures. We hope you will join us in Frost Arena on Friday 1 April anytime from 9 a.m. to 3 p.m.
Our booth will highlight library resources related to culture. You can explore world cultures in more depth by visiting the library in-person or online. Following are just a few ways to dive into the topic. Peruse the library’s collection of local, regional, and world newspapers found on the main level of the library. Use the library’s catalog to find records for books, government documents, DVD’s, and electronic books. Consult resources in the library’s Reference Collection on the library’s main level, including multivolume works on Culture and Customs organized by country and Food Culture organized by country or region. Use one of our many databases to find articles in magazines, journals, or newspapers. Explore Government Information, including international information. Ask a librarian to help with your research. Consult with a librarian in person at the Information Services Desk or click on the Ask Us link on the library’s homepage for information on connecting by phone, e-mail or instant messaging. MyiLibrary is an electronic platform that offers library users access to some of the most topical and current e-books available today. Users can access a wide range of research, reference and reading materials online from any location. Users can search across many e-books or conduct searches within a particular e-book. You can access MyiLibrary by clicking on Find Articles & Databases on the Library’s home page http://www.sdstate.edu/library/ then scrolling down and clicking on MyiLibrary. Nepal Night will begin at 6 p.m. Sunday, Feb. 13, in the Volstorff Ballroom of the Student Union. Hosted by SDSU’s Nepalese Student Association, the event offers an opportunity to sample Nepalese cuisine and culture. If you want to learn even more about Nepal, remember the library offers many great resources. One place is to look for information is a general database like EBSCOhost MegaFILE, which is linked on the library’s homepage. I looked for information on Nepal’s culture and retrieved many helpful articles. According an article by Bailey, Nepali is the official language of Nepal, but its people speak over fifty languages and dialects (People & Culture sec.). Check out the accuracy of this fact with the hosts of Nepal Night or by comparing other sources. Bailey, Ellen. “Nepal.” Our World: Nepal (2010): 1-6. EBSCO MegaFILE. Web. 10 Feb. 2011. * Library Research Tools such as: Interlibrary Loan, Citing & Copyright, Distance Library Services, Renew Books Online. If you like to read and then discuss what you’ve read, consider the book Mountains Beyond Mountains by Tracy Kidder. This fall students in twenty-five sections of freshman opportunities and orientation courses, such as General Studies 100, will be reading the book, a biography of Dr. Paul Farmer. Farmer, a world leader in public health and medical anthropology, founded Partners in Health, an organization which has provided health care to disadvantaged populations throughout the world, conducted ground-breaking research, and influenced policy in world health organizations. The book focuses on Farmer, a fascinating individual, who Kidder describes as “a man who would cure the world,” but it also invites discussions of broad and varied topics like public health, poverty and wealth, land use, and the responsibilities of the individual. This fall you’ll find plenty of students who have read the book, but if you can’t wait contact Tim Nichols, Dean of the Honors College, at 605-688-5268, about a summer reading group. To further advance study and discussion, Dr. Farmer will speak on campus on November 19, 2009, as the Griffith Honors Forum lecturer. Ready to get started? The library has two copies of Mountains Beyond Mountains (BOOKS/UPPER LEVEL R154.F36 K53 2003) and the University Bookstore has copies for sale. If you are interested in further investigation of the topics addressed in the book, the library has many resources available. Search the library’s catalog to find records for books and government documents; search databases, such as EBSCOhost Megafile and ProQuest, for articles in newspapers, magazines and journals. Also consult the library’s Topic Guides for research guidance in a particular subject area. Librarians are available to help you research—consult with us in-person at the Information Desk, send an e-mail, a text message, or set up an appointment. You are currently browsing the archives for the Library Databases category.